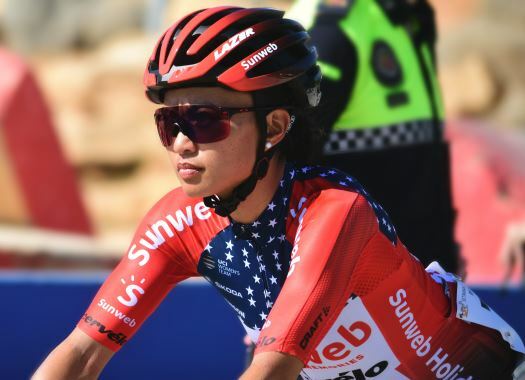 Team Sunweb's Coryn Rivera has finished in the eighth position of the Trofeo Binda. The American rider joined the front group too late to take part in the final sprint. Rivera already knows what is like to take the victory at the Italian WorldTour race, but this time she couldn't participate at the final sprint. Despite the efforts of her teammates, the American champion joined the front group in the last moments of the race and was too far behind to participate in the bunch sprint, which was won by Marianne Vos. "The girls were really amazing today," Rivera commented at the end of the race. "We went all in on the plan. We stayed compact and Juliette (Labous) and Pfeiffer (Georgi) positioned the team well going into the early key moments. Once into the local laps Floortje (Mackaij) and Liane (Lippert) were vigilant with attacks and when the final break went clear, Leah (Kirchmann) and Floortje went all in for the chase. "I came into the final corner super hot and thought I had a straight shot to the line but got boxed in at the wrong moment and lost all my speed. We didn’t get the result we wanted but we can be super proud of the effort we put in today."